Home » vestibular » Meclizine (Antivert) to Treat Dizziness - Bad Idea? 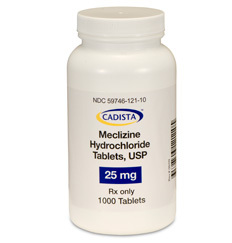 Meclizine (Antivert) to Treat Dizziness - Bad Idea? It seems almost reflexive that anybody who complains of dizziness gets a prescription for meclizine (aka antivert, dramamine, bonine, etc). However, this drug which is also available over-the-counter is often not the best way to treat dizziness. Depending on what is causing the dizziness, this drug may actually prolong or even worsen this symptom. Meclizine is an anti-histamine similar to allergy medications like claritin, benadryl, zyrtec, etc. It also has anticholinergic properties to help with nausea, vomiting as well as vertigo by depressing labyrinth excitability and vestibular stimulation. In essence, the way meclizine works is analogous to how a narcotic helps with pain. It doesn't actually "fix" anything, but helps with symptoms (i.e. a narcotic helps with the pain of a broken leg, but doesn't actually fix the broken leg). I would argue that it is better to treat the disease correctly and cure the dizziness rather than just treating the "dizzy" symptom without curing what's causing it. Although meclizine is a good medication to take for motion-sickness on a boating trip or briefly for certain vertigo situations, let's look at a couple common dizzy conditions when meclizine is often prescribed incorrectly. If you are not sure what type of dizzy condition you have, click here to try and figure it out. BPPV is due to displacement of crystals within the inner ear causing vertigo (spinning dizziness). Correct treatment is the precisely performed sequence of head position changes which often cures the dizziness within 10 minutes, 80% of the time. Read more about the condition here. By giving meclizine to treat BPPV is like giving a narcotic to treat a dislocated shoulder. The maneuvers to fix BPPV is just like popping a dislocated shoulder back in. The other thing to consider is that BPPV vertigo lasts only minutes whereas meclizine takes about 60 minutes to take effect after swallowing the pill...so why take a drug whose effects will kick in way after the dizziness has already disappeared??? Meniere's Disease is due to fluid build-up within the inner ear to the point that membranes within rupture. Correct treatment is geared towards preventing this fluid build-up... something meclizine does not do. Read more here. Giving meclizine to treat the acute vertigo symptoms of Meniere's Disease briefly is not incorrect, but it shouldn't be the main way this condition is treated long-term. Indeed, taking meclizine exclusively may actually prolong the dizziness by inhibiting vestibular compensation. 3) Inner Ear - Provides sensory information based on gravity, linear acceleration, and rotational movement. 4) Spine & Brain - Gathers and processes all the information in order to maintain balance. If dizziness is attributable to abnormal vision and proprioception, only the inner ear is than providing balance information. Meclizine should not be given in this situation because it diminishes inner ear balance functioning resulting in even worse balance. Better treatment is repetitive exercises that strengthen the inner ear balance system. Obviously, if a person has spine damage or stroke injury, meclizine should be avoided for the same reason. This condition is when the inner ear vestibular balance system is weaker than it should be resulting in imbalance. The opposite extreme is a supra-normal vestibular system found in gymnasts who are superb on the balance beam. Treatment for vestibular hypofunction is a specific type of physical therapy known as vestibular rehabilitation. This type of treatment is analogous to the repetitive exercises gymnasts perform to make their sense of balance super-normal in order to accomplish amazing things on the balance beam without falling over. Meclizine impedes the effect of vestibular rehabilitation therapy and although therapy will still help, the improvement takes MUCH longer when compared to patients who do not take meclizine. It is worth repeating that taking meclizine may actually end up prolonging the dizziness by inhibiting vestibular compensation. Perspectives on the pharmacotherapy of vertigo. Archives of Otolaryngology, 111: 609-612. Habituation and balance retraining therapy: A retrospective review. Neurologic Clinics, 8(2): 459-475. Good article. My ENT Rx'd meclizine but suggested I go on an elimination diet to figure out what was triggering my vertigo. I kept a food diary. Within 6 weeks I determined wheat and oats were my triggers and also ragweed and (later) cedar pollen. Meclazine and valium helped only to control symptoms while I figured out preventive measures.